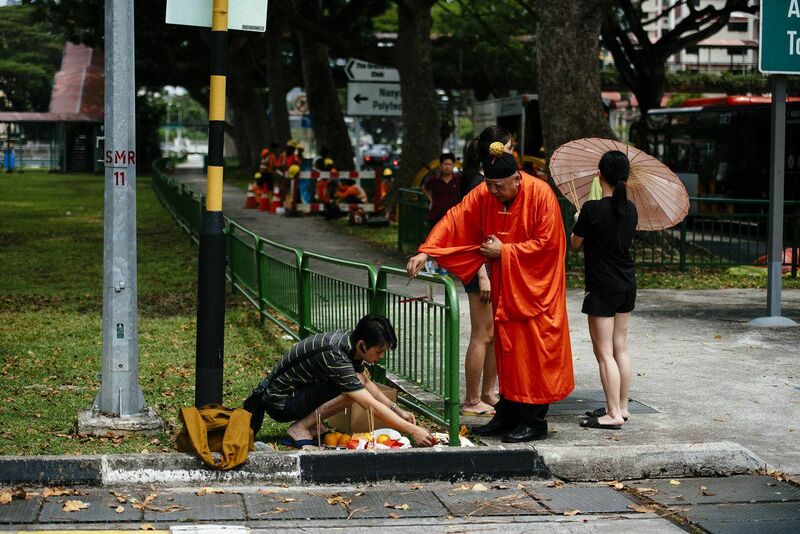 A father and daughter were among three pedestrians killed when a lorry ploughed into them as they were walking on a pavement just before a traffic light junction near Yio Chu Kang MRT station on Monday (April 23) morning. The third victim, a 63-year-old man, was a family friend. The father of the 25-year-old lorry driver, who has been arrested for dangerous driving causing death, claimed his son's vision had "gone blurry" before the accident. The incident occurred in Ang Mo Kio Avenue 6 at about 9.30am. Videos show the lorry mounting the kerb, narrowly missing at least one pedestrian before it hit 87-year-old Mr Chua Cheng Thong and his daughter Gina Chua, 59. Their friend's identity remains unknown. The Singapore Civil Defence Force said its officers had to use rescue lifting airbags to extricate two victims from under the lorry. Paramedics pronounced all three dead at the scene. When reporters visited the Chuas' third-floor flat in Ang Mo Kio on Monday evening, a relative asked the media to give the family privacy. Neighbours said Mr Chua had lived in the unit for more than a decade, although they seldom saw him. "He keeps to himself and I don't see or hear him very much," said 53-year-old Mr Ng Ghim Cheng, who co-owns a fish farm. The accident also damaged nearby railings, a traffic light and a bus, which was hit while it was waiting at the traffic light junction. The bus windscreen was badly cracked. However, no passengers were hurt, said SBS Transit senior vice-president of corporate communications Tammy Tan. "Our hearts go out to the families of the pedestrians," she added. The lorry driver also suffered injuries and was taken conscious to Khoo Teck Puat Hospital. He has been arrested for dangerous driving causing death. The Straits Times visited the premises of Chang Fu, the company listed on the lorry, but it was locked. The company's director, Mr Xu Shu Jing, is believed to be the driver's father. A family member declined to comment on the case when The Straits Times visited his flat in Jurong West. However, Mr Xu told Today newspaper that he spoke briefly to his son at the hospital, and said his son had blurred vision before the accident. "(My son) couldn't see anything, and then the accident happened," he was reported as saying.